We’ve just checked into Desert Rhino Camp, and our group is casually huddled around a crackling bonfire for the first of many daily safety briefings. After landing in Windhoek (Namibia’s capital city) earlier that evening, we packed ourselves like sardines into a five-seat Cessna 210 airplane. Approximately two hours later, following a quick pit-stop to refuel—and a touch of turbulence—the last leg of our journey was complete at last. 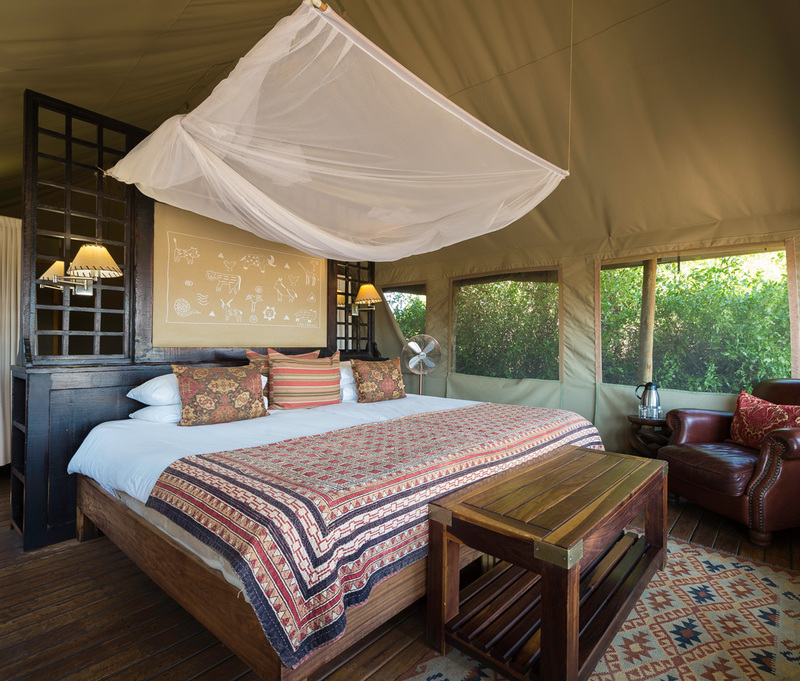 Desert Rhino Camp boasts eight spacious Meru-style canvas tents. Each is outfitted with an en-suite bathroom and private veranda overlooking the sweeping plains. 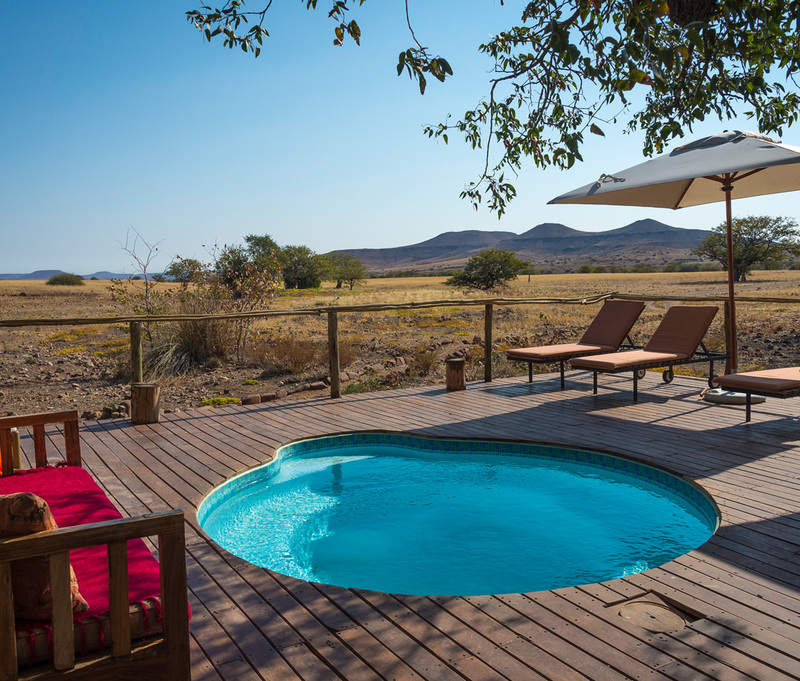 It’s all tucked away in the sprawling Palmwag Concession, which lies within a remote region known as Damaraland. Revered for its impressive collection of desert-adapted wildlife, the most sought-after species is the critically endangered black rhinoceros. This particular area happens to be home to one of Africa’s largest free-ranging black rhino populations, which is precisely why we’re here. Although we’re in the desert, the surrounding landscapes are untamed and strikingly beautiful, almost otherworldly. Looking out from the plane’s tiny passenger side window, it’s a bit easier to grasp the vastness and diversity of Damaraland. Its stunning sceneries change within moments, as if you were watching a National Geographic slideshow. Ancient waterways course through craggy, rust-colored earth like veins. Minutes later, a string of flat-topped mountains rise unannounced from the dunes, followed by swathes of windswept grasslands punctuated with pops of hunter-green shrubbery. After completing our safety briefing, we’re escorted to a lively bush dinner animated by clapping, singing, and dancing around a new, even larger bonfire. The brilliant smattering of constellations overhead make it seem as if the sky is somehow alive. The menu for the evening features a selection of local specialties, such as lentil soup, game-fillet steak, and pap, a cornmeal porridge similar to polenta. We’re all exhausted after a long day of traveling, so it’s an early night for the bunch. The next morning, we awaken early for a quick breakfast in the camp’s open-air restaurant and prepare for an exciting day ahead. The plan is to join a group of expert rhino trackers who will—fingers crossed—lead us to witness these endangered creatures in their natural habitat. At this point, the trackers have already departed to get a strong head start. The team relies on old-school tracking methods versus modern technologies, so there’s no guarantee we’ll see a black rhino in the wild. Sure, using some sort of GPS locator would simplify the process, but they fear illegal poachers could potentially hack into the devices and follow the trail of digital breadcrumbs directly to their target. Although the number of black rhinos in this region is finally on the upswing, poaching is still a very real threat, as it has been for decades. We pile into a tricked-out Land Cruiser with our guide, Jimmy Limbo, who fervently steers us through the dunes. Jimmy is a native Namibian and has worked with Wilderness Safaris for nearly 15 years. His energy is palpable as he passionately describes all of the key players surrounding us. “See those beautiful bushes?” he asks. “They’re called euphorbia virosa and they’re extremely poisonous to humans, so please don’t touch!” He also informs us that the springbok in the distance aren’t simply jumping; they’re “pronking”. And he’s quick to point out a tower of giraffes, explaining how the male’s darker-colored coat indicates his age, thus making him more attractive to the females. 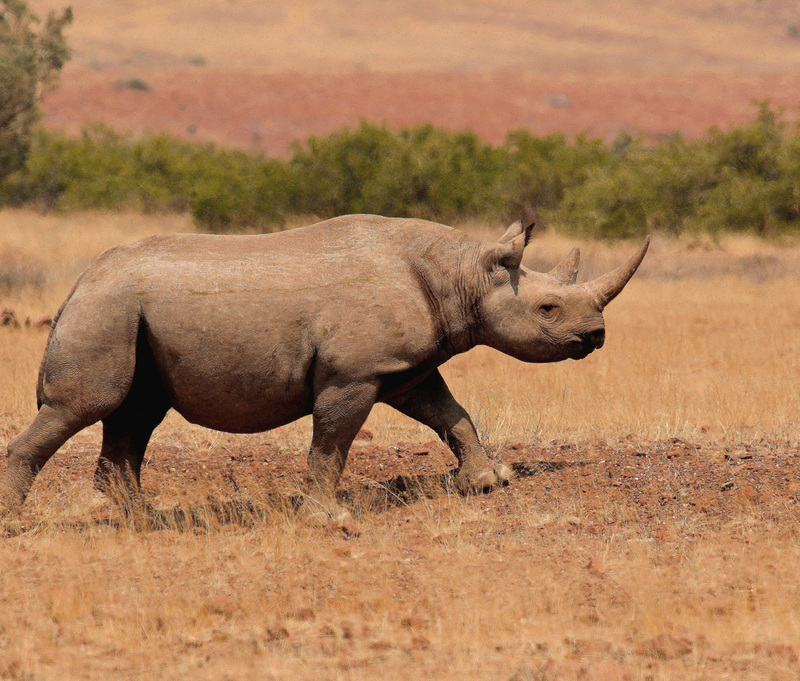 But we aren’t here for deadly shrubbery or aging giraffes—we want to see some black rhinos. All of sudden, Jimmy’s walkie talkie emits a series of crackles followed by a muffled voice. His eyes light up. Confirmation received; the trackers have spotted a pair of black rhinos not far from our location. We can’t believe it: Less than two hours have passed since we left camp, and we’re already en route to our first rhino sighting. Shortly afterwards, Jimmy parks the vehicle and we hop out to join the trackers, our cameras in hand. We begin our journey on foot, heading toward the two dots set back in the distance. Single-file and silent, we softly follow the trackers’ lead. Every command is communicated through a simple set of hand signs: stop, squat, continue. Remember, the rhinos may be fundamentally blind, but they’ll be able to hear us coming from a mile away if we’re too loud. We even approach from a strategic angle so the wind doesn’t blow our scent toward the unsuspecting rhinos and blow our cover. Slowly, the specks on the horizon come into focus and begin to take shape. We break out the binoculars for a closer look. The pair is tooling around, munching on an oversized bush while standing in its shade to escape the beating sun. We stare in awe, watching their every move from afar. Meanwhile, the trackers reveal their notepads and pens. Part of their job is to document these sightings and report back with their findings. They begin jotting down their observations, sketching the horns and tails, documenting their overall physical condition. They also take some photos to supplement their notes for cataloguing purposes. Some trackers can even identify the rhinos by name based on characteristics like ear markings or horn size. Suddenly, as we’re snapping photos, one of the rhinos turns its head and looks toward our direction. The other joins him, and we freeze in place. “He might have picked up our scent,” whispers one of the trackers. Seconds later, both rhinos are mobile and walking straight toward us. The trackers slowly lead us behind a nearby shrub, instructing us to crouch down and keep quiet using the designated hand signals. Would the rhinos be able to hear the thuds of our heartbeats, on the verge of pounding from our chests? Luckily for us, the winds soon change and they lose interest after our disappearing act. They continue along on their merry way, vanishing from sight. With a collective sigh of relief and adrenaline still pumping, we decide it’s time for lunch. During the course of the afternoon, we see one more solitary black rhino before we turn back and return to camp for the day. 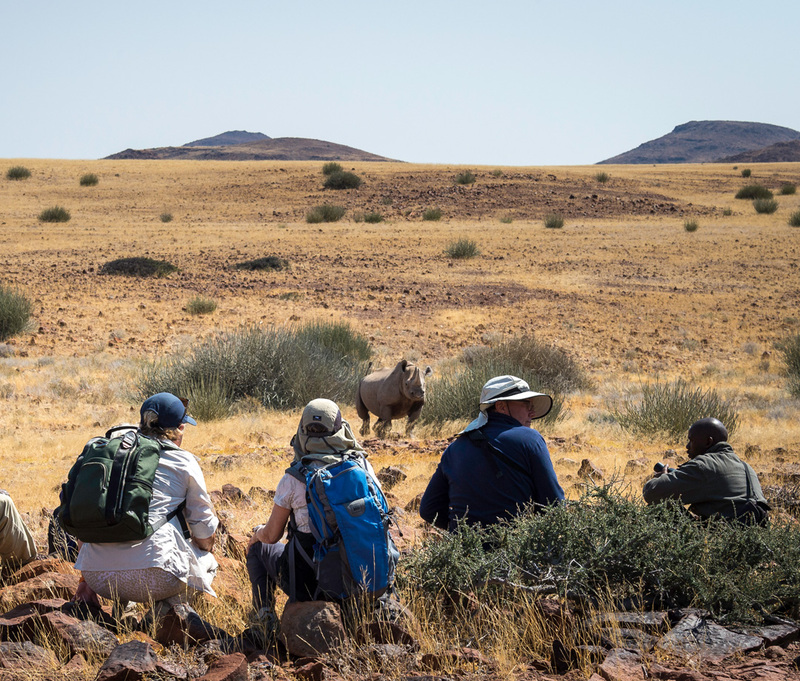 The camp, he informs us, works in partnership with the highly respected Save the Rhino Trust Namibia, as well as the Palmwag Conservancy and people from the local communities. Together, they develop responsible ecotourism initiatives and support conservation efforts in the region. 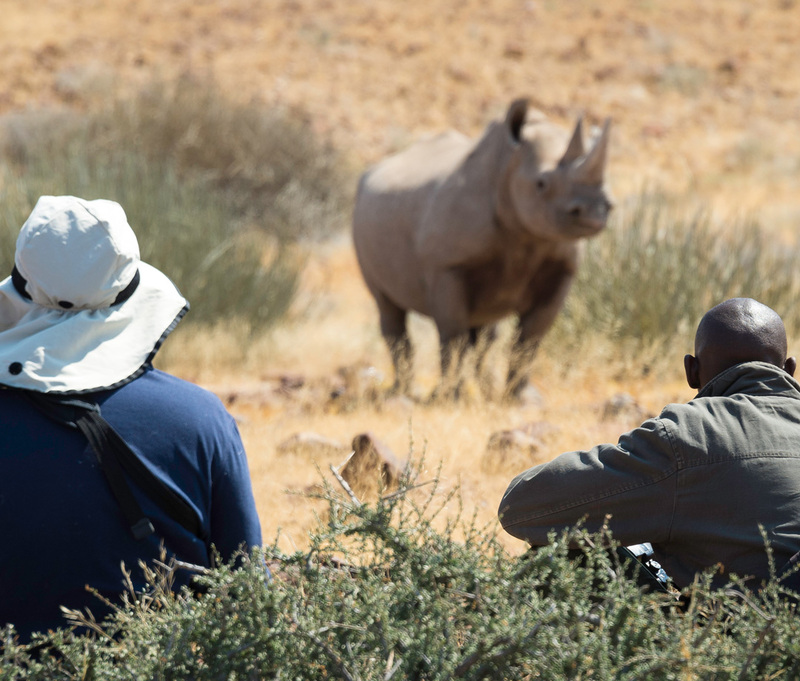 They focus on the protection, monitoring, and understanding of the local black rhino population, and the non-governmental organization is almost single-handedly responsible for the preservation of the species in the area. The Palmwag Concession covers a massive area spanning approximately 1,500 square miles. In what’s known as a public-private community partnership, Wilderness Safaris has teamed up with the three local communities that administer the Palmwag Concession. A percentage of turnover from Desert Rhino Camp, in addition to an annual fee, is paid directly to the conservancies. So every guest that stays at the camp plays a role in actively and financially supporting the partnership’s rhino conservation efforts. The camp itself is powered by a hybrid system and uses a combination of different energy sources, including a diesel-powered generator that charges a bank of batteries, which then supplies electricity to part of the camp. Each guest tent is equipped with a small solar panel and inverter, as well as a solar-powered geyser system to provide hot water. The camp also employs a number of green practices to reduce their footprint, such as using energy-efficient lights and appliances, offering reverse osmosis water filtration on site, and only using eco-friendly detergents. It all folds into the brand’s bigger mission. Since 1983, Wilderness Safaris has been dedicated to conserving and restoring Africa’s wilderness and wildlife through the lens of life-changing journeys. Operating in seven countries with more than 40 camps, everything they do is guided by the pillars of the “4Cs”: conservation, community, culture, and commerce. In addition to handling direct bookings, they also work with trusted travel companies to spread the word. Piper & Heath is a prime example, which was founded by Chris Liebenberg, another safari expert born and raised in Namibia. In terms of current rhino population size, the camp doesn’t typically release any official statistics. Those numbers are kept private in an effort to deter potential poachers. However, it’s generally estimated that the rhino population numbers have quintupled over the past 30 years—a truly astounding feat. Ganuseb explains there’s a true sense of pride in working as a rhino tracker. He feels lucky to work with Desert Rhino Camp. And there are plenty of positive indicators proving their hard work is paying off. For example, last year there were no rhino carcasses found within the conservancy, meaning not a single rhino was killed at the hands of a poacher. There have even been some pregnant black rhino sightings and young calves spotted in the area. All are promising signs that reinforce the partnership’s mission. “Every day that I find a rhino,” says Ganuseb, “I’m a happy man.” And he’s certainly not the only one.